It is single pole and double throw on-off-on. 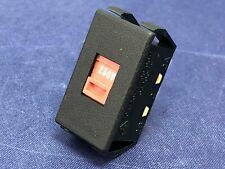 It is made by DEPOND and is 0.5 A 125 VDC and 6 A 125 VAC. All goods are new unless stated otherwise. Product Range : R13 Series. SWITCH SLIDE ON-OFF SPDT. Actuator Type : Raised Slide. Colour : Black. Switch Operation : Off-On. Switch Mounting : Panel. External Depth : 22.4mm. 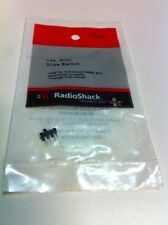 You are purchasing part number R13-608C1-02-BB-9A Manufactured by MULTICOMP. 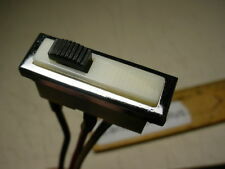 SMALL BEST QUALITY SLIDE SWITCH. 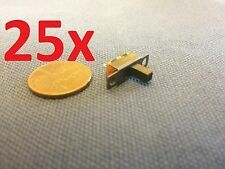 Useful small size quality switch with a very positive switch action, not to be confused with cheap Chinese imitations ! You can reach us at. We will respond during these hours. All attempts are made to represent each item in an honest and forthright manner. Color: Black. Part Number: 6331. YOU MAY ASK WHY DROP 120VAC TO 60VAC ?. THIS SWITCH WAS USED ON VACUUM. STACKPOLE 3 POSITION CENTER - OFF, 2 SPEED, SLIDE. DIRECTION IS STRAIGHT THROUGH 120VAC IN 120VAC OUT. THE OTHER DIRECTION FEEDS. Manufacturer: NTE. Trust NTE's Decades of Quality and Service. Part Number: 54-667. 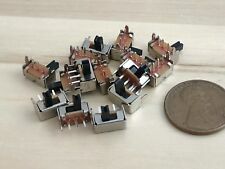 LAMB 1101-M2S4AQE2 SLIDE SWITCH SPDT R/A PC MOUNT, 2A 250V, 5A 125V (LOT OF 10) (143549). Switch Mounting Panel. Insulation resistance: 100MR at 500VDC. Switch Operation (On)-Off-(On). 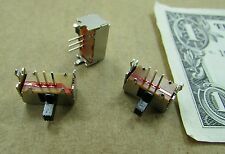 Apem Miniature Slide Switches - 25000N Series. Switch Mounting Panel. Insulation resistance: 500MR at 500VDC. Switch Operation (On)-Off. Orientation Vertical. Switch Mounting Panel. Insulation resistance: 500MR at 500VDC. Switch Operation (On)-Off.